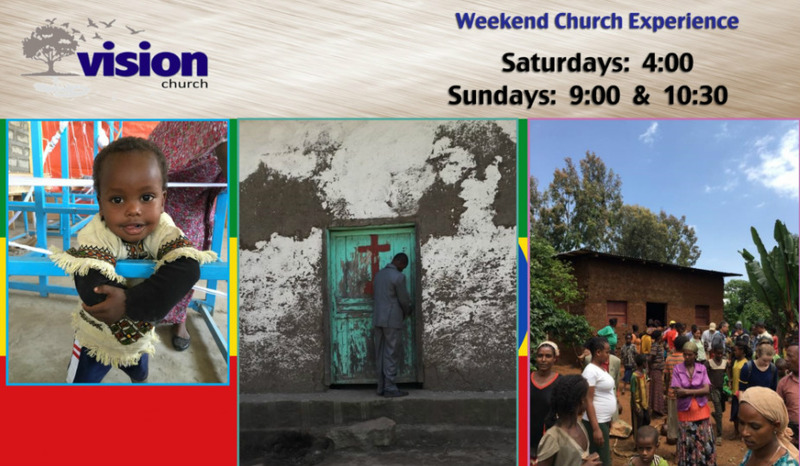 You may not know that Vision Church has a staff member, Tillahoun Molla (Tilly) in Ethiopia. Being Ethiopian himself, Tilly understands the people of Ethiopia and has first-hand knowledge of the needs, the people and the culture of the Kembata Tembaro region and its surroundings. The region is one of the most densely populated rural areas in Ethiopia and is in the midst of an ecological crisis. Without irrigation systems, farmers are at the mercy of the weather, and in a place where the rains do not always deliver on schedule, it can mean that the region’s people go hungry more years than not. Most families in the region live on less than 50 cents per day and many of the regions are without enough food, jobs, schools, healthcare and opportunity. To help combat this issue, when you give to Vision Church, a percentage of your giving goes directly to Tilly in Ethiopia to aid them in their mission and share Jesus with the people there. By living out our Matthew 25 mission, this is just another way God is enabling people to bless others across the world. We have a team of 9 people heading to Ethiopia the end of May 2018. Here is a list of items we'd love to take with us to disperse the neediest of people in the whole world. In this video (from 2016), you can see the families that were directly helped through our efforts from our mission trip in 2016. What a special thing for everyone involved to be able to see the faces of those we are helping and for them to see the real people who are loving on them in the name of Jesus! Check back for pictures and video from mission trip 2018!